Even though this movie was made for a younger market, my wife and I thoroughly enjoyed all the movies from this series and having a dog that looks like one of the stars in this movie, Rosebud, we may have been a little biased. Disney once again returned these mischievous and entertaining dogs to the small screen in this Christmas tail… err… tale about the spirit of Christmas plus canines. For those unaware of the “Buddies”, they revolve around five dogs that include Budderball, B-Dawg, Rosebud, Buddha and Mudbud, each with a different personality and each with different way of either getting themselves or others into an anecdotal mess. 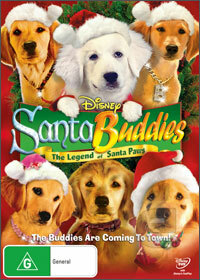 Santa Buddies is also a modern interpretation of a classic Christmas story which involves Budderball, one of the dogs who is unfortunately on Santa’s naughty list. With help from Puppy Paws, the fun loving son of Santa Paws from the North Pole, he attempts to show Budderball the true meaning of Christmas but unfortunately a spanner is thrown into the works and when the magical Christmas Icicle begins to melt, it causes everyone in the world to forget the true meaning of Christmas. Of course, it’s up to Budderball and his Buddies to save the day and together they help Puppy Paws do the unthinkable as six dogs save Christmas for an entire world who are oblivious to them. Featuring action, drama and comedy, Santa Buddies is as entertaining as the original movies and boasts some great voice acting by all involved. Of course, the star for us was Budderball and Mudbud who seem to get involved in all sorts of hilarious scenes and had us and our nephew in stiches. Santa Buddies is definitely a great family movie that features good video, great sounding audio and some really cool looking special effects. This is the perfect movie to watch at Christmas or just before to get into the spirit.